I learned as a teacher that it is not a good idea to make assumptions about your students. Once, I assumed a large group of fourth graders could follow multiple step-by-step directions to make origami peace cranes. After forty-five minutes of running from student to student and sweating through my dress shirt, only about ten of the eighty students participating were able to go home with a completed peace crane. I also assumed I could introduce a class of kindergarten students to really cool interactive website on the school's brand new set of laptops. After about five minutes I realized that most of the students couldn't find the letters to type the web address. Then, once I got everyone on the website I realized that they weren't able to effectively use the touchpad. Assumptions spell certain doom in teaching and also in parenting. Just like the time, I assumed that my daughter could go to the zoo after one day of potty training without a diaper. We returned home early not because I wasn't prepared with extra clothes for her but because I didn't expect to need extra clothes for me. (No, I didn't have an accident. I just happened to be holding her up to see the animals when she had hers.) This week, I learned that I need to be careful to not assume that my children completely understand issues like family safety and social skills. We read a half dozen books by Julia Cook including Bully B.E.A.N.S, My Mouth is a Volcano, and A Bad Case of the Tattle Tongue. The number of questions that my children had while reading these books told me that my wife and I need to spend more time talking about many of the issues that Julia Cook presents in her books. Julia Cook has written over 20 books to help parents and children with life issues, fears, behaviors, and personal hygiene. She is a former elementary school guidance counselor that now has broadened her reach to help families and children through her children's books. In a video clip posted on her YouTube Channel, Julia Cook states, "As a guidance counselor, I would have kids come into my office and actually think that I could wave my magic counseling wand and solve their problems for them. But, a good counselor, a good teacher, a good parent gives the child the wand and shows them how to use it." My son's favorite book by Julia Cook was A Bad Case of the Tattle Tongue. My wife and I assumed that our oldest two children knew all about tattling, as they are very good at it! However, we learned pretty quickly that our children had lots of questions and needed a few strategies to completely understand why tattling is not a good habit. 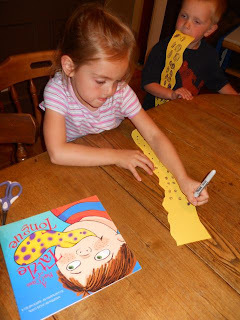 To help them have a greater understanding of the social skill we read the book multiple times, talked about the strategies described by Julia Cook in the book, role played the strategies, and reviewed what we learned. My son insisted on rereading the book before our family discussion and role playing. He said, "Dad, we always read the book again before we do an activity!" 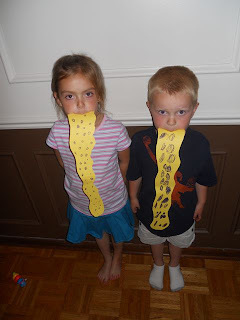 First, we made tattle tongues with a piece of yellow construction paper and a purple marker. In the book, Josh has a problem with tattling too much. 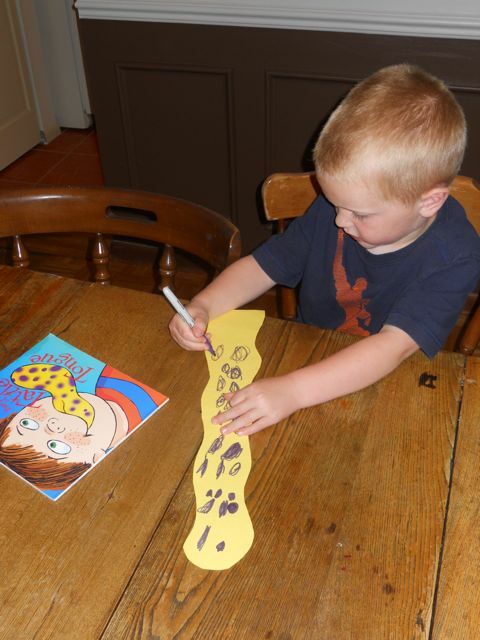 His tongue grew too big for his mouth and turned yellow with purple spots. My kids had a terrible case too. They have been known to tattle on each other. Luckily, they were about to learn the four rules for tattling. Most importantly, they were going to learn the difference between tattling and providing a warning about a dangerous situation. I made up a few scenarios that involved tattling, but they did not really start to apply the knowledge they learned from the book until they started acting out recent situations that happened at school and at home. 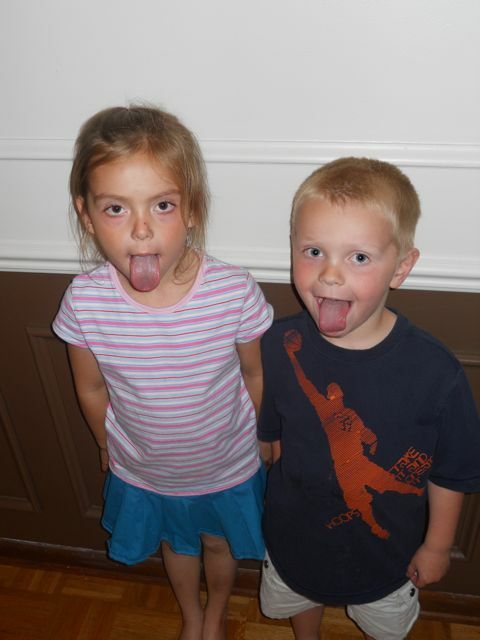 In this picture, my son and daughter were acting out an incident. 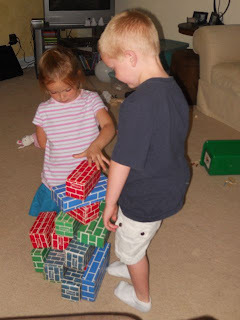 A classmate of my son's did not tattle on him when he accidentally knocked over his block tower. My daughter said that there was no need for him to tell an adult because no one was in danger and they were able to solve the problem themselves. I am happy to say that my children's case of Tattle Tongue cleared up after our evening of role playing. Phew! Julia Cook has been praised for her books dealing with more complex issues including bullying, sexual predators, and child abduction. In an interview on CNN she talked about her book Scoop, "Most people are nice and kind and they would never hurt you. There are only a few people out there that are scoopers (the term Julia uses to describe kidnappers). We found out what all the scoopers were doing and I wrote a book to make you smarter than they are. I never talk to a child about what could happen. I talk about what they can do." In her book Bully B.E.A.N.S. she teaches kids to stick together to combat the bully. She said in an interview with Fox News Chicago, "85% of our kids are bystanders, so if you want to fix this problem you got to work with that group. A bully is only a bully if they have the power of the other kids to back them up. We can teach our bystanders to unite and work together." I love Julia's proactive approach to these issues. I want to read, discuss, and role play more of her books with my children. I know that I can't predict every situation, just like getting peed on at the zoo, but I can at least prepare my family with the tools necessary to handle a tough situation if it presents itself. I have three birthdays that are very special to me. When I was 11, I had kids bring bags of groceries to my party instead of presents. Then after the party, my mom and I donated all of the groceries to the local food bank. It was a true gift to be able to help others. Another favorite birthday memory was when I got my first accordion at the age of 6. The other favorite birthday memory was when I got a unicycle when I was 7! At the age of 10, I put them together! A yellow, purple-spoted tongue- gah! That will surely cure the tattles. These look like very helpful learning books. Happy Birthday, Julia Cook! Thanks Susanna! 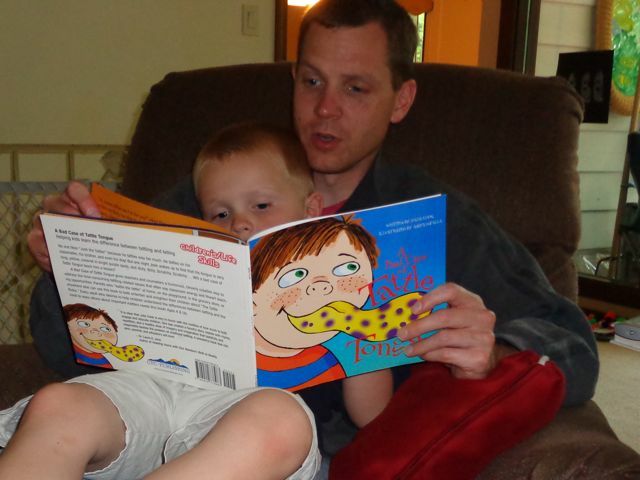 The best part about Julia's books was the discussions I was able to have with my children about the issues. I really want to get my hands on a few more! What terrific teaching tools this author's books sound to be! Thank you for sharing this one with us, and for introducing me to a new author! Thanks Beth! All of these books were new to us too! This birthday celebration was a great experience for my family. There is so much about this post that I love. First, I love the idea of having guests bring bags of food for presents and then paying it forward. Wonderful! Next, as always, I love the engaging way you interact with your children. Beautiful! Last, I love that I got to learn about a new author. Fabulous! I've been in early ed for a long time and have never heard of her books. There are a lot of stories/issues to explore in this field. It is amazing that she's taken her experience and made it a pb experience to share. Thank you for this post, Eric! Thank you Pam! We just read a bunch more books by Julia Cook - Making Friends is an Art, Wilma Jean the Worry Machine, and I am a Booger Treat Me with Respect! My kids loved them all! I highly recommend her books! Happy birthday, Julia! What a wonderful resource. I can see us reading many of her books in the future. We've just started in with tattle tongues at our house. As for your zoo outing, if it makes you feel any better, Finley, my younger one, peed on the ground in the outdoor play area at the aquarium....two seconds after we passed a bathroom, and I asked if he needed to potty. Potty training is tough business. Kirsten, Potty training is tough! I am sure Julia Cook has been approached to write a potty training book. Oh my! Your activity is hilarious. My kids will love this. Pinning it!